Imagine that you could order up a robotic boyfriend or girlfriend. Would you do it? According to Sherry Turkle, an MIT professor who studies the social impacts of science and technology, more people than ever are answering "yes" to this (still hypothetical) question. After all, human partners are fallible; they disappoint; they get angry and distracted. Robot mates, on the other hand, are endlessly attentive to our needs. They have no other demands on their time and attention. We cannot frustrate or disappoint them. They require no risk and no compromise. At least, this is how we imagine them. You can't wander into RadioShack and walk out with a robot companion--not yet, and probably not for a while. But Turkle fears that we're getting closer to the day when robots will be able to meet these most human needs--and, more terrifying, when we will be happy to let them. Here at the 2013 annual meeting of the American Association for the Advancement of Science, Turkle (who was also featured in NOVA scienceNOW's segment on social robots) declared that we have arrived at this "robotic moment not because we have built robots worthy of our company, but because we are ready for theirs." Researchers are currently testing bots that can help teach and tend to children and that can provide care for the sick, the disabled, and the elderly. But the real headline, according to Turkle, isn't rapidly-advanced robotics: It's that humans now accept or even yearn for the day when robots will be fully integrated into caregiving roles that were once considered uniquely human. The PARO robot, which looks like a baby seal, has been used in therapeutic settings to improve the well-being of patients with Alzheimer's and other types of dementia. Turkle has been studying human perceptions of robots since the 1980s and argues that she's witnessed a dramatic change over the past three and a half decades. The robots of the 1980s, she says, inspired us to place heightened value on the qualities that make us human: the ability to feel, to love, to grieve. Now she sees this romantic view on the decline. Today, when it comes to our most intimate relationships, fallibility is liability, not a tie that binds. But are we really ready to forge these bonds with bots? Turkle cites the emergence of robo-pets like the Aibo dog as evidence that we are replacing living relationships with artificial ones. Parents once bought pets in part to teach their children about the cycle of life and death, says Turkle; now, these same parents are relived to choose instead an of-the-shelf pet that will never get sick and never die. Yet it isn't clear that dog-lovers are turning out in droves to replace their flesh-and-fur mutts with metal and plastic. In fact, the American Veterinary Medical Association reports that (live) pet ownership has increased steadily since their first surveys in 1986, showing a dip only recently, a decline that is more likely due to the poor economy than the allure of robo-dogs. Indeed, Sony's Aibo, often considered the first consumer robo-pet, was reported to have sold fewer than 100,000 units worldwide in its first three years on the market, and it was discontinued in 2006. Meanwhile, there are 70 million pet dogs in the United States alone. These pets may be demanding--they need to be fed, watered, walked, and scooped-up after--yet we keep bringing them into our homes and even calling them family. Will Turkle's dark vision of our future come to pass? I don't know. The technologies that have transformed our lives most dramatically are those that promise to enhance our human connections: Facebook allows us to keep up with friends and family in an encyclopedic play-by-play. Our go-anywhere mobile phones let us stay in touch with anyone, from anywhere--you can even videochat from the ladies' room, if that's your thing. These technologies may be exasperating, yet they--not robots like Aibo--are the innovations that have become ubiquitous. What do you think? Are you dreaming of the day when you and your robo-spouse will spend the afternoon romping with your robo-dog? When you will be cared for in times of sickness by a robo-nurse and your children tended by a nannybot? Or will you choose to take your chances on other human beings? Over the next week, Missy Cummings, an associate professor at MIT and drone expert, will be discussing unmanned aerial vehicles with Jason Margolis, a reporter for The World, and Arun Rath, a reporter for Frontline. If you have a question or comment, be sure to post it below. We'll forward the most thought-provoking and well-reasoned responses to our panel. For more about unmanned aerial vehicles, watch NOVA's Rise of the Drones. 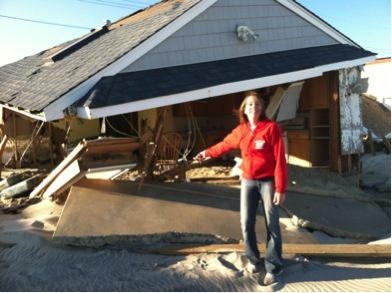 Late in the afternoon on Monday, October 29, as Hurricane Sandy closed in on New Jersey, I logged into Facebook and posted this picture of my sister and me outside our Jersey Shore beach cottage back in 2009, along with the caption "Be strong, tiny beach shack!!" The house was tiny: two closet-sized bedrooms, a miniature bathroom, and one larger room that served as both the living room/family room and the kitchen. The pullout bed touched the kitchen table. But on a sunny summer weekend, we would somehow manage to pack nearly a dozen people in that tiny little cottage for relaxing and quaint beach getaways, memories I cherish. Many of my favorite childhood memories are of family and friends huddled around the picnic table playing Monopoly at all hours of the day and night, jumping for joy when my mother found that last stubborn lost puzzle piece under the couch and fit it into the jigsaw puzzle we'd been doing for days (the neighbors probably thought we'd won the lottery! ), and laughing as my father blamed his horrendous missed beanbag toss on the faint ocean breeze that was always swirling down the coastline. 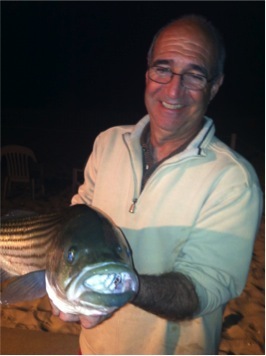 All in all, there were great friends, great fun, and great fresh fish caught on the beach right in front of the house. Fast-forward to that Monday. While friends and I enjoyed our day off from school, I began to get more nervous as the first reports of what would become one of the most destructive storms in U.S. history started to pour in. My Facebook news feed updated like crazy as my Jerseyan friends posted about raging winds felling trees and knocking out power in their homes. (Thank goodness for smart phones!) All the while, classmates and I sat flashlights-in-hand in the study room of our graduate dorm awaiting the plunge into darkness, wondering if the relative breeze blowing some leaves off the trees was the worst Boston would see of Sandy. By morning, I knew the destruction had been much worse than expected. Being from New Jersey, I've seen my fair share of hurricanes. But in the past, it's always seemed that the predictions were worse than the reality. But the unlikely combination of circumstances that set the stage for maximum destruction--the high tide, the incoming nor'easter, and unusually warm waters from the Gulf--left me with little hope for my house and so many others like it on the Jersey Shore. 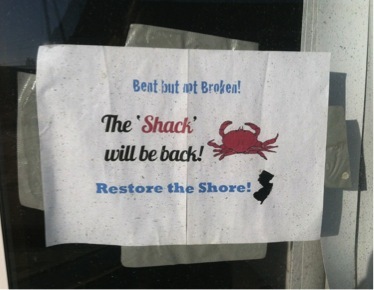 I was here at the NOVA office on Tuesday when I first saw video of the damage at the Jersey Shore. I was shocked to discover that that first video shot by the New Jersey Coast Guard was of my neighborhood (though mislabeled--it's Ocean Beach III in Lavalette, New Jersey, not Seaside Heights). You can also spot my neighborhood at 39:26 in NOVA's film on Hurricane Sandy, Inside the Megastorm. 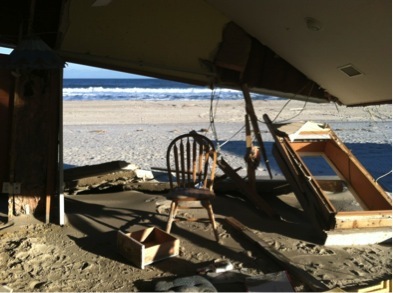 When I got home to New Jersey the week of Thanksgiving, my mother and I thought it was finally time to go down to the shore, assess the damage, and see if there was anything we could salvage from our house. Only residents are allowed in the area, so we folded up our tax returns from 2011--our proof of ownership--and headed down early, knowing that at 3 p.m. the police would make their rounds to clear the island of everyone but authorized officials and the military. 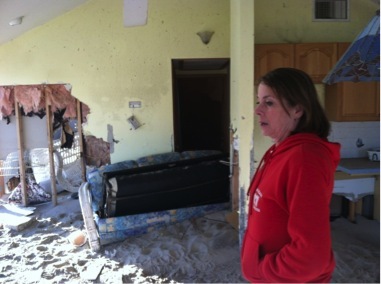 Even after seeing dozens of videos and pictures of the damage at the shore, experiencing it in person was shocking. There were boats out of water and slammed through homes, houses falling into sinkholes, and streets lined with the damaged contents of each house, waiting to be taken to one of the humongous mountains of garbage and debris being piled up around the state. 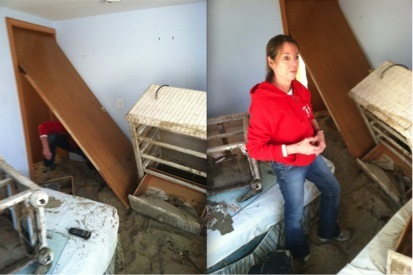 The following pictures show the incredible height of the sand that was piled up in the house. 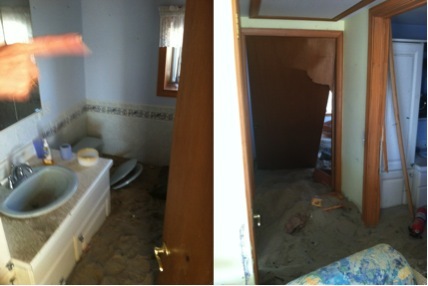 The left picture was taken in the bathroom; you can see that the sand is so high it nearly covers the entire toilet. The picture on the right is the entrance to my bedroom; the door was broken and pushed in from the power and weight of water and sand slamming against it. There isn't much more I can say about this besides what you see above. When I look at the pictures now, I cannot help envisioning that first monstrous wall of water that must have slammed through our sliding glass door, sending surging rushes of seawater into the house and then tearing down the walls and dragging all the house's contents out to sea as the wave receded with incredible power back into the ocean, only to strengthen itself for the next earth-shattering blow. We don't ordinarily look at innocent water as a force to be reckoned with, but it knocked down most of this house like a deck of cards. It's as if mother nature is telling us stubborn humans that she'll always be stronger, so we'd better start listening. The last ten years have thrown their share of challenges at us New Jerseyans and New Yorkers. Multiple disasters have tried our hearts and resilience, but they've proved to us and the world the power of community both to cope and rebuild. Though it's unfortunate that our little house in Ocean Beach III is gone, we are very lucky compared to the countless victims who lost primary homes and loved ones in the freak of a storm that materialized during just the right conditions to cause maximum destruction. We're a state half-famed and half-infamous for our strong will and pertinacity, and we're determined to rebuild. Power has been restored, streets are being cleaned up, and the public transportation system is now up and running. There is certainly a lot of work to be done, but I'm sure that the East Coast will be back and better than ever in no time. For more information about how Sandy formed, the damage the storm caused, and relief efforts, check out NOVA's Inside The Megastorm. The coverage of the Sandy Hook massacre has produced a lot of news coverage, some of it accurate and some of it not. In the course of researching the segment "Can Science Stop Mass Murder?" for the PBS special "After Newtown," the team at NOVA compiled a comprehensive list of articles and links about the tragic event and mass shootings more generally. Below is that list. Some provide context specific to Sandy Hook, others delve into the scientific research that seeks to understand what might transform these people into killers, while still others ask the question, is it right to blame these events solely on mental illness? We hope you find these links helpful and informative. A look back at some of the most notable mass shootings in recent U.S. history: from Killeen, Texas, in 1991 to recent rampages at a movie theater in Aurora, Colorado, and Sikh temple in Wisconsin. "Exploring the Mind of James Holmes and the Tragedy in Colorado"
by Jerome Elam. The Washington Times , August 1, 2012. "In Gun Debate, a Misguided Focus on Mental Illness"
by Richard A. Friedman, M.D. The New York Times , December 17, 2012. "Can You Call a 9-Year-Old a Psychopath?" by Jennifer Kahn. The New York Times Magazine , May 11, 2012. "'I Am Adam Lanza's Mother': A Mom's Perspective on the Mental Illness Conversation in America"
by Liza Long. The Huffington Post (republished from The Blue Review), December 16, 2012. "'I Am Adam Lanza's Psychiatrist': A Response from the Mental Health Trenches to 'I Am Adam Lanza's Mother'"
by Anonymous. xoJane.com, December 17, 2012. "The Violent Brain: Ingredients of a Mass Murderer"
by Lauren Migliore. Brain World magazine, December 15, 2012. "EXPERT: What Makes a Mass Killer?" by Michael Welner, M.D. ABCNews.com, February 13, 2007. "Mass shootings: Why it's so hard to predict who will snap"
by Stephanie Pappas. FOXNews.com, July 25, 2012. "The Pain of Being Linked By Asperger Dx to a Mass Shooter"
by Lucy Berrington. Psychology Today , December 16, 2012. "Mass Murders, Unlike Serial Killers, Are Hard to Profile"
by Lizzie Crocker. The Daily Beast , July 20, 2012. "Can This Man Predict Whether or Not Your Child Will Become a Criminal?" by Josh Fischman. The Chronicle Review , June 12, 2011. "Good News and Bad News About Gun Laws, Mental Illness and Violence"
by Jeffrey Swanson, Ph. D. "Bill of Health" Harvard Law blog, October 5, 2012. "Adam Lanza: Newtown Massacre Suspect a Puzzle to Authorities"
"Psychiatrist: Showing Video is 'Social Catastrophe'"
by Mary Papenfuss. Newser.com, February 10, 2008. "What Pushes Shooters Over the Edge?" by Bill Weir. ABCNews.com, February 9, 2008. "A Guide to Mass Shootings in America"
by Mark Follman, Gavin Aronsen, and Deanna Pan. Mother Jones , July 20, 2012. "Current Directions in Violence Risk Assessment"
by Jennifer L. Skeem and John Monahan. Current Directions in Psychological Science , March 23, 2011. "A Jurisprudence of Risk Assessment: Forecasting Harm among Prisoners, Predators, and Patients"
by John Monhan. Virginia Law Review , May 2006. "Don't Blame Autism for Newtown"
by Priscilla Gilman. The New York Times , December 17, 2012. "What Drives Suicidal Mass Killers"
by Adam Lankford. The New York Times , December 17, 2012. Over the past year, a steady trickle of books, articles, and film proposals has crossed my desk about world-changing events that the ancient Maya are said to have predicted for the date of December 21st, 2012. The latest is a press release for a book claiming that physicists searching for the Higgs boson (the so-called "God Particle") at the giant particle accelerator at CERN, near Geneva, are at risk of triggering "seismic events that could release cataclysms prophesied by the Mayan Calendar 2,000 years ago." Other popular theories involve giant solar flares wreaking havoc on satellite communications, or a "galactic alignment" of the plane of the Milky Way that could bring spiritual enlightenment rather than doomsday. In anticipation of either dire or uplifting events, tourists are flocking to Maya sites in Guatemala, Mexico, and Belize in record numbers. If you're inclined to suspect that Y12 might be as big a fizzle as Y2K, you may still enjoy a sober look at the evidence for what the ancient Maya actually believed about the cosmos and the calendar. There's no better introduction to that subject than "The End of Time: The Maya Mystery of 2012," a popular book by Anthony Aveni, a pioneering investigator of Maya astronomy. Shot through with characteristic humor and a gift for sharp explanation, Aveni's book presents a clear picture of Maya creation myths and the motivations of their skywatchers. He outlines how the Maya followed three separate calendar cycles that mesh together like gears in a bicycle wheel; the biggest "gear," or cycle, was the "Long Count," which tracked the number of days that had elapsed since a creation date in 3114 BC, far back in their mythological past. If you project the Long Count forward in time, then a sub-cycle known as the baktun, equivalent to roughly 395 solar years, is due to turn over and reset itself, like the numbers in an odometer, on December 21st. 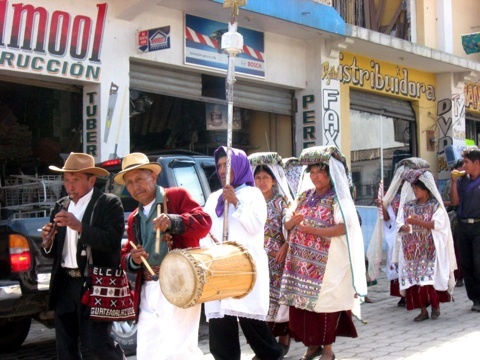 An Easter procession in the highland town of Nebaj, Guatemala. Today's Maya observe ceremonies that are a blend of Christian and pre-Hispanic influences. So what did the Maya believe about this cycling of their calendar? Since the late 1970s, scholars have made astonishing progress in deciphering Maya writing--the intricate hieroglyphs that they painted on vases or carved into stone monuments between AD 250-900. We now know that many of the inscriptions relate the ancestry of their rulers back to the start of the Long Count or other auspicious events in the deep past. Others concern the political present and give details of accessions, alliances, military conquests, and the overthrow of rival rulers. To see a vivid slice of this evidence, Mark van Stone's "2012: Science and Prophecy of the Ancient Maya" presents a highly accessible pictorial guide to Maya art and hieroglyphs and how they relate to the 2012 question. The bottom line is that amid all the rich hieroglyphic records kept by Maya scribes, there's total silence about what they actually thought about the future turnover of the baktun. Only two inscriptions even mention the turn of the 13th baktun, which corresponds to December 21st, 2012 in our calendar. One of them was discovered this summer at the Maya site of La Corona in Guatemala by David Stuart, a leading scholar of Maya writing, who says he was stunned when he spotted a text mentioning the 2012 turn of the cycle. Like so many other inscriptions, Stuart says, its context is the politics and history of the 7th century AD, specifically the divine status of one of La Corona's rulers. "The point was to associate the divine king's time on the throne to time on a cosmic scale," he says. To understand more about how the Maya recorded and justified the affairs of their rulers, see Stuart's popular book titled "The Order of Days: Unlocking the Secrets of the Ancient Maya." In his final chapter, Stuart concludes, "No Maya text, ancient, colonial, or modern, ever predicted the end of time or the end of the world." Today, in the highland villages of Guatemala, traditional Maya calendar cycles are still observed by "Daykeepers," or shamans, although the cycles are no longer geared to the fortunes of powerful kings and queens. The most important of these cycles is a ritual calendar of 260 days, perhaps related to the length of human pregnancy, known as the tzolk'in. The same cycle was widely observed by the Maya 1,000 years ago. One of the Daykeepers' major preoccupations is to perform ceremonies correctly so that the tzolk'in keeps running smoothly, thus ensuring the fertility and health of the community. Allen J. Christenson, an anthropologist who has worked for decades in Guatemala, says that rural Maya villagers had little or no awareness of any kind of apocalypse in December 2012 until they heard about it from outside media sources. But they do believe the world is going to die. As Christenson explained recently in Archaeology magazine, the Maya believe that the world dies each day when the sun sets or crops are harvested. "The world is constantly dying," he says, "and the role of the Daykeeper is to make sure they get things going again." In this perspective, the idea of a single cataclysmic "doomsday" is simply a projection of our own culture. 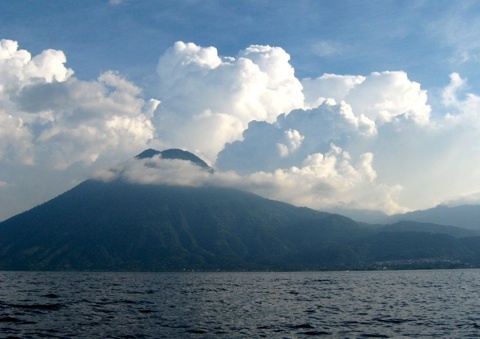 Lake Atitlan in Guatemala is the focus of traditional creation myths among the Maya. In the lakeside community of Santiago Atitlán, anthropologist Allen J. Christenson apprenticed himself to a Daykeeper to gain insights into Maya beliefs and ritual practices. While no serious evidence supports the idea that either the ancient Maya or traditional shamans believed in a world-shattering event, the modern mythology of a 2012 apocalypse has taken on a life of its own. Across Latin America, many of today's roughly seven million Maya people are planning events and festivals to celebrate their identity around the upcoming date. Throughout Latin America, the 21st will be an occasion to celebrate the rich heritage of Maya civilization, which science has played a vital part in recovering. Anthony F. Aveni, 2009. "The End of Time: The Maya Mystery of 2012." University of Colorado Press. Mark Van Stone, 2010. "2012: Science and Prophecy of the Ancient Maya." Tlacaelel Press. David Stuart, 2011. "The Order of Days: Unlocking the Secrets of the Ancient Maya." Harmony. Zach Zorich, 2012. "The Maya Sense of Time," in Archaeology magazine, Volume 65 Number 6, November/December. David Stuart talks briefly about the 2012 apocalypse in a recent episode of WAMC Northeast Public Radio's "The Academic Minute." On the day that NOVA's "Ultimate Mars Challenge" aired, I was invited to attend a modest little gathering held in its honor. It was one of those times when I realized that I was clearly the least knowledgeable person in the room. The other attendees included a quantum physicist and a group--a group--of advanced roboticists. It would have been easy for me to feel intimidated by the brainpower present in that room, but I wasn't. Because my friends are...well... friendly, and because the setting was casual, I felt totally comfortable, and was able to contribute to the discussion constructively, making the conversation rich in a way it likely would not have been had I been absent. That's the idea behind science cafés. In a casual setting like a bar or café, members of a community come together to have a discussion around a scientific topic. Sometimes, these topics are formal science, like microbiology or physics, but just as often the events revolve around everyday science, like the science of cooking, brewing, or sports. An expert researcher opens up the event with a brief description of his or her area of study, and then the floor is open for questions and conversation. NOVA has supported science cafés since 2004, and now we administer ScienceCafes.org, where you can tap into the international science café network of close to 300 registered cafés, find one near you, or find resources to help launch a new one. NOVA's education group produces new materials to support café organizers and speakers, from simple giveaways and promotional materials like coasters to full media clips of NOVA episodes that can be used to get the conversation started. We believe that informal strategies for science education and literacy have unique benefits. In traditionally structured, lecture-style presentations, the direction of communication--the flow of information--is one-way. But for most of us, engagement on any subject, but particularly in science, is a two-way street. Scientists invested in outreach must be able not just to speak fluently and clearly about their work, but also listen and be relatable. If, as a scientist, you want your audience to be as invested as you are in your field of study, then it's absolutely crucial that you help them understand why what you do is important. The best way to do that is to let them ask you questions about it. Let them explore for themselves and learn how they relate to what you do. It is in encouraging this sort of exchange that science cafés really shine. By keeping spirits casual and opening the floor to the audience rather than keeping the focus solely on the speaker, cafés make each attendee, no matter his or her initial understanding of the topic, more comfortable and more able to contribute to the discourse fully and without trepidation. Further, an effective speaker can gain incredible insight through audience input. Everyone is there with a purpose, and so all feel an increased sense of agency with regard to their own learning process. Attendees and speakers learn more, understand more deeply, and are more often inspired to share their newfound knowledge with others in the community. This was certainly the case with me at our "Mars Party." My expert friends were not only knowledgeable, but also relatable, patient, and thorough. It was a powerful learning experience that I won't soon forget. If you aren't lucky enough to be invited to science-themed parties but are still interested in seeking out informal learning experiences, we at NOVA encourage you to visit ScienceCafes.org to find your local science café, or to start one of your own. A couple of weeks ago, word leaked out from the Curiosity team that one of the rover's instruments had found something "earthshaking." Immediately people began speculating that the NASA mission had discovered organic compounds, which would be pretty good proof of life on Mars. The news spread quickly, and NASA began backpedalling, hoping to manage expectations, instead saying the results were "interesting." Fast forward to earlier today, when Curiosity's main scientists held a press conference about their findings so far. The rover had scooped some soil, they reported, which turned out to be completely normal Martian soil. Sort of. This batch also contained chloromethanes of various types (one, two, and three chlorine atoms). The chlorine part wasn't exciting—Phoenix, a previous rover, also discovered perchlorates—but the methyl part was. Compounds with methyl groups often indicate the presence of methane, which can be a telltale byproduct of living things. Does this mean we finally found life on Mars? Maybe, or maybe not. The rover "has made detection of organic compounds, we just don't know if they're indigenous to Mars," said John Grotzinger, project scientist at the Mars Science Laboratory. In other words, the finding is "interesting" and definitely not "earthshaking." Underwhelmed? Welcome to science in real time. Tests must be painstakingly run and rerun. Results must be compiled, questioned, and interpreted. All of that takes a long time, which Grotzinger emphasized at the press conference. There are still a bevy of tests that scientists must perform before they can determine whether the detected organic compounds are indeed from Mars and were not deposited there by an asteroid, for example. Once that is confirmed, then they have to determine whether those compounds were created by a living thing and are not just the byproduct of a more prosaic chemical reaction. The good news is that Curiosity is only a few months into its two-year mission. There's still plenty of time. Today's announcement is slightly more intriguing than a standard early mission update. The results are exciting, but not that exciting because there's still lots more work to be done. Stiill, Curiosity scientists are hopeful. After this first round of tests are complete, the rover will start its trek up Mount Sharp, which may have more tantalizing, or perhaps more definitive, secrets locked within its ancient rocks. "We've been at the gas station, gassed it up, checked the oil," Grotzinger said. "We're going to kick the tires around a little bit, but then we're ready for our trip. And that's when our science mission of exploration really gets into full gear." You have no doubt heard that getting a problem "off your chest" will make you feel better. You may even have experienced the cathartic effect of talking about your worries. As it happens, disclosing does more than just make you feel better, it can actually change the workings of your brain when the pressure is on. The end result can be better performance under stress--on tests, in job interviews, and even on the playing field. Take research conducted by one of my graduate students, Gerardo, at the University of Chicago. A few years back, Gerardo asked a group of students to take a difficult math test while we ratcheted up the stress. We called in several different techniques for putting the pressure on--including offering students $20 for stellar performance and reminding them that, if they performed poorly, they would jeopardize the ability of a partner who also wanted to win money. We also videotaped students and told them that math teachers and professors would be watching the tapes to see how they performed. Immediately after hearing what was on the line, we asked some students to write for about 10 minutes about their thoughts and feelings concerning the test they were about to take. We wanted the students to get their feelings about the pressure off their chest so we told them that they couldn't be linked to their writing by name so they should feel free to write openly and freely about their worries. Other students were not given the opportunity to write, but just sat patiently for about ten minutes while the experimenter got all the testing materials together. What we found was quite amazing. Those students who wrote for ten minutes about their worries before the math test performed roughly 15% better than the students who sat and did nothing before the exam. Keep in mind that this difference doesn't just reflect variation in math ability across our writing and no-writing groups. We know this because everyone took a practice math test before the experiment got started and there was no difference in performance between the two groups. Those students given the opportunity to write about their worries before the math test improved, while those who didn't write choked under the pressure. These results have also been extended to high-school classrooms. In another study, ninth graders were randomly assigned to an expressive writing condition (writing about their worries about the upcoming test) or a control condition (thinking about items that would not be on the upcoming test) for 10 minutes immediately prior to the first final exam (biology) of their high-school career. Both students and teachers were blind to the particulars of the study and the condition students were in. Those students who expressively wrote outperformed controls. This was especially true for students who have a tendency to worry on tests (i.e., students high in test anxiety). High test anxious students who wrote down their thoughts beforehand received an average grade of B+, compared with those who didn't write, who received an average grade of B-. Why does such a simple writing exercise have such a big impact? The answer has to do with the content of the writing itself. Writing reduces people's tendency to ruminate because it provides them with an opportunity to express their concerns. Expressing concerns gives people some insight into the source of their stress, allowing them to reexamine the situation such that the tendency to worry during the actual pressure-filled situation decreases. Worries are problematic because they deplete a part of the brain's processing power known as working memory, which is critical to successfully computing answers to difficult test questions. Working memory is lodged in the prefrontal cortex (at the very front of our heads, sitting just above the eyes) and is a sort of mental scratch pad that allows people to "work" with whatever information is held in consciousness, usually information relevant to the task at hand. When worries creep up, the working memory people normally use to succeed becomes overburdened. People lose the brain power necessary to excel. For several decades, psychologists has been extolling the virtues of writing about personally traumatic events in your life, such as the death of a close family member or a difficult breakup. Time and time again, psychologists have found that, after several weeks of writing about a life stressor, people have fewer illness-related symptoms and even show a reduction in doctor's visits. Expressing your thoughts and feelings about an upsetting event--whether a trauma in the past or a pressure-filled test coming up in the future--is similar to "flooding therapy," which is often used to treat phobias and posttraumatic stress disorder. When a person repeatedly confronts, describes, and relives thoughts and feelings about his or her negative experiences, the very act of disclosure lessens these thoughts. This is good for the body because the chronic stress that often accompanies worrying is a catalyst for health problems. Disclosure seems to be good for the body and for the mind. When university freshman, for example, are asked to write about the stress of leaving home for the first time and going off to college, they report a decrease in their worries and intrusive thoughts. Interestingly, writing about their worries also leads to improved working memory over the course of the school year. Expressive writing reduces negative thinking in stressful situations, freeing up brainpower to tackle what comes your way. This essay was excerpted and modified from "Choke: What The Secrets Of The Brain Reveal About Getting It Right When You Have To" © 2011 by Sian Beilock. Published by Free Press, a Division of Simon & Schuster, Inc. Excerpted with permission from the author. All Rights Reserved. Scientists working on NASA's six-wheeled rover on Mars have a problem. But it's a good problem. They have some exciting new results from one of the rover's instruments. On the one hand, they'd like to tell everybody what they found, but on the other, they have to wait because they want to make sure their results are not just some fluke or error in their instrument. Curiosity's scientists aren't alone—the Higg's folks went through the same thing, double- and triple-checking their data (and probably more) before they were confident what they were seeing was a real result. That's just science. It pays to be careful. But given the leak, it's a good bet that the Curiosity scientists believe the result is bonafide and not just a fluke. The NASA team has a lot on the line. The launch, transit, and landing were so flawless that expectations are high for the remainder of the mission. There's also a human dimension to the suspense—many scientists on the team have been dreaming of a day like this since they were kids. Here's to hoping they really have found something amazing. Ever since writing has existed, people have wanted to send secret messages to one another--and others have wanted to intercept and read them. This is the fourth installment of a blog series taking you through the history of cryptography, its present, and future possibilities of unbreakable codes. Follow the links to read the first, second, and third parts of the series. In the last post I talked about Public Key Cryptography, a system that derives its security from "hard" math problems like finding the factors of large numbers. But increases in computing power have made once-impenetrable codes solvable in just a few months. Keeping ahead of technological development by increasing the length of the secret number used to encode information--the key--is always an option, but there is still a chance that someone will find a tricky way to calculate your private key, letting them read all your messages. One of those tricks could be quantum computing. Scientists have shown that a quantum computer could use some clever properties of quantum mechanics to help codebreakers solve many of the math problems at the heart of public key cryptography. How? A quantum computer encodes "bits" of information in the properties of subatomic particles. And here is where things get strange: Because unobserved particles--according to quantum mechanics--exist in a combination of all possible states, a quantum computer is able to store and operate on multiple numbers at once. Suddenly, "impossible" tasks like factoring large numbers can be done in the same time it would take to multiply them. Although quantum computers are still in their infancy--nothing with enough complexity to run that sort of program can be built yet--codemakers can see the demise of public key cryptography on the horizon. It's not like everyone would have a quantum computer, but chances are that someday in the future, if the government or a big business wants to read your encrypted mail, they'll have access to a computer that can do so. But in 1984, Charles Bennett and Gilles Brassard found a way to transmit a key that is provably secure, even in the face of quantum computers. Their method, which is still used today, uses properties of quantum mechanics to transmit a random key--and any eavesdropping party would not only get useless information, but would even alert the sender and receiver to an attack. Pretty cool stuff. Here's how it works: The One-Time Pad, which I discussed in a previous article, basically encodes data by using a randomly-generated key as long as the intended message. It's impossible to break the code and read the message without the key. Bennett and Brassard's quantum key distribution protocol, called BB84, acts as a sort of high-tech One-Time Pad: A random key is generated using quantum mechanics and shared securely between two people, who can then use it to encode and send unbreakable messages however they want. It eliminates the problem of transferring a key securely. The process of generating the key takes advantage of the quantum mechanical property that measuring something can change it. Here are the basics: photons are sent from one person to another, measured at both ends. The measurements that match up will be used as the basis for a randomized key. The sender and receiver each have two kinds of polarized filters: one that only lets in horizontal or vertically oriented photons, and one that only lets in the diagonals. They agree that photons that are vertically or diagonal-forward polarized will represent binary 1, and photons that are horizontal or diagonal-backward will be 0. The sender generates a photon and prepares it with one of the two random filters before sending it along an optical cable to the receiver. Once it's there, the receiver measures the photon with his own randomly chosen filter. Sender and receiver both choose a horizontal/vertical filter, both measure 0. Here's the tricky part. If the receiver measures the photon with the same filter as the sender, he'll get the same result. But if he uses the wrong filter, there's no such guarantee: If he's been sent a vertically polarized photon and he measures it with a diagonal filter, he has a 50% chance of getting each of the diagonals as his result. Sender randomly chooses horizontal/vertical, but receiver randomly chooses diagonal. Chaos ensues! The sender and receiver go through a long string of photons in this way, recording the bit values and which filter they used for each. Afterwards the receiver uses another line of communication--it doesn't have to be secret--to tell the sender which filters he used for each (without giving away the results of each measurement). The sender reveals which filters she used, and they agree to only count the photons where they used the same filters. That way, they know that they've measured each photon the same way, so they'll have the same values. In this way they build up a secret, random string of numbers using the photons that they both measured in the same way. This string of numbers will be their key. Now imagine that you are an eavesdropper. If you are able to intercept a photon between the users, you won't know how the sender prepared it, so you have a 50% chance of using the wrong filter. That means that, not only might you get the wrong answer, you might also mess up the value for the receiver because of that quantum mechanical property I mentioned where measuring the photon can change its value. In fact, if the sender and receiver compare the values of a few of their photons and find any disagreements, they can tell that somebody's been trying to read their photons and discard the suspect values from the key. Eavesdropper tries to measure photon but uses different filter than the sender and receiver, messing up measurements. Oh, and by the way: Once the sender and receiver start revealing the filters they used, it's far too late for you to use those filters yourself. The photons are long gone. There are a few commercial systems that implement quantum key distribution today, including ID Quantique, a spinoff from a University of Geneva experimental physics group. The technology has already been used in highly secure transmissions, from Swiss ballots to World Bank transactions. But quantum key distribution hasn't become mainstream quite yet, mostly due to a few basic issues. For one, the machines are all handmade by physicists, so they are expensive and inconvenient to commission. Another issue is that the system requires dedicated optical cables to send the photons, whereas almost all currently existing fiber-optic infrastructure, although fairly widespread, relies on sending multiple signals on the same cables. And finally, there's the issue of scalability. Right now quantum key communications must be cabled directly from one user to another--like from a bank to a single high-powered client--but a vast new infrastructure would be needed to connect a large network of users. Richard Hughes, a quantum researcher at Los Alamos National Laboratory, is working on answers to these design problems. In the future, he expects quantum cryptography to be used in smart grid applications and to eventually extend to everything from smartphone and tablet security to securing data in the virtual cloud. He says that quantum cryptography is much further along than we realize: The technology that exists today can already be used reliably in optical fiber networks for systems of medium scale, and experiments suggest that through line-of-sight delivery of secure keys--that is, sending the photons through open air--it could be possible to generate keys with satellites in orbit. Although the key creation is perfectly secure, there still may be ways to outwit the system. For instance, in April 2010 researchers at the Norwegian University of Science and Technology found a way to trick a commercial system into revealing its secrets by shining a laser into the receiver's filter, blinding it while they read the photons themselves. The team was kind enough to warn companies using quantum technology before publishing their results so the security hole could be fixed. Certainly this won't be the only flaw that researchers--and hackers--discover. After all, you can have the strongest, most well-secured door in the world, but the room's only safe for the time it takes to blast through the wall. As time goes on, security flaws will be found and repaired, approaching the perfectly secure system promised by quantum physics, and maybe even revealing more about how our universe works. The fight between codemakers and codebreakers has driven technological and mathematical advances through history--from frequency analysis to mechanical bombes during World War II to computers to quantum programs. Quantum key distribution promises an unbreakable one-time cipher that companies, governments, and even individuals will be able to use to send information with perfect security and store private data with an unbeatable cipher. So--at least for now--the secret keepers have won. What will we do with that power? Inside NOVA takes you behind the scenes of public television’s most-watched science series. You'll hear from our producers, researchers, and other contributors. It's a forum where you can see what's on our minds and tell us what's on yours.